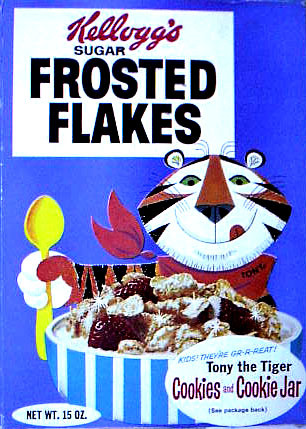 My kids, now in their 30s, still correct me for calling them Sugar Frosted Flakes. Ate the stuff out of the box. When in a bowl it was with milk....and sugar!! And don't forget Thurl Ravenscroft. "They'rrrrrrre Great " as Tony would exclaim on TV. At least it was real sugar, not high fructose corn syrup or whatever they like to call it now. This was from back in the days when the "Food People" were up front with the sugar in their products because "Sugar was good." I grew up in the "sugar generation". Couldn't get enough. Sugar Pops, Sugar Smacks, Sugar Frosted Flakes.... those were the actual names of the products! I made sugar sandwiches.... plain white bread, butter, and sugar.... Still have a sweet tooth. Unfortunately, it's the ONLY tooth I still have. Remember when the food industry knew what growing kids needed - Suger and lots of it.